On June 13, 1933, Massachusetts voted overwhelmingly to do away with Prohibition. That decision was ratified on June 26. Over 400,000 people voted for repeal, and the measure passed by a margin of just over 80%. During Prohibition, residents of Massachusetts saw an almost unrestricted flow of liquor to their state. A few days later, an article ran describing the methods used by the rum runners, saying that radio was frequently used to contact coworkers on the shore. Nothing could be done about said ships as long as they kept their distance from the coast, and as a result the bootleggers were evidently quite bold, as on one occasion they used the radio to ask the Coast Guard “out to sea with a doctor as a member of the crew had fractured his skull.? Similarly, when schooner carrying 6,000 gallons of alcohol hit a shoal, the Coast Guard was obligated to rescue it, and the “contents later being compelled by law to be shipped out?rather than confiscated. Another article, ran about a week later, pointed to the inability of the government to stop these ships' cargo from being delivered, with “Coast Guard officials at Washington frankly admit[ting] that tremendous quantities of liquors are...landed each month , despite their efforts to enforce the law against such landings. ?This same article mentions “that about one in 50 consignments being smuggled over the coastline route is captured.? Massachusetts also faced other problems as a result of Prohibition. 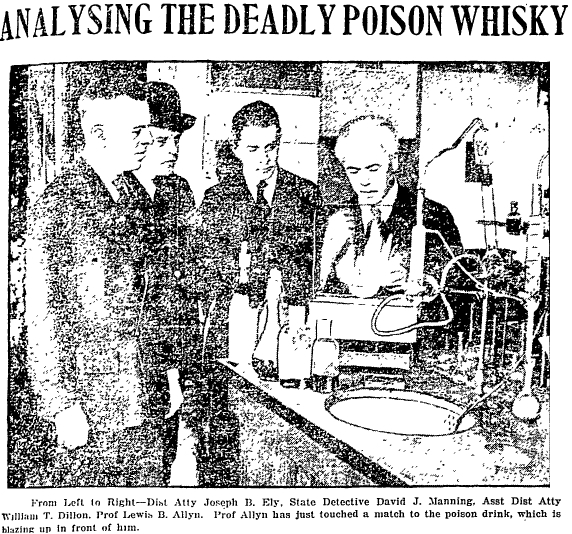 In 1920 there were several cases of poisoning due to tainted liquor. The state resolved to try 19 people for murder. "BIG FLEET OF RUM RUNNERS HERE?LARGEST EVER OFF THIS COAST Seven Steamers and Fourteen Schooners on Hand. ?quot;?u>Boston Daily Globe (1923-1960)?30?Apr. ?924 ProQuest Historical Newspapers Boston Globe (1872 - 1924). Photo courtesy of the Boston Daily Globe, accessed via ProQuest.